A moisturising spray for the hair roots? Surely this must be wrong and foolish? I mean we are told only too often that conditioner is for the ends of our hair and not for the roots. Moisture equates to grease and yet along comes Palmers Coconut Oil Strong Roots Spray and flips all the rules on to their head, please excuse the poorly executed pun. So here's the skinny, my scalp is forever itchy and easily irritated. This is apparently due to my head being completely dried out which I blame on a life time of hair bleach and dry shampoo. I don't often suffer from dandruff but the tight, itchy sensation is not pleasant. Enter Palmers Coconut Oil Formula Strong Roots, this light, leave in mist not only conditions the hair but also the scalp. I find it stops my scalp from being itchy, tight or sensitive for that matter and the good news is that it does not leave a greasy residue on the roots or anywhere else for that matter. Oh and I should mention it smells nothing short of fantastic - a blend of natural coconut, eucalyptus and coconut oils. In my opinion the coconut and mint prevail in terms of scent. Personally I tend to apply the Palmers Coconut Oil Strong Roots Spray straight after I have washed my hair and apply it root to tip but it works equally well on dry hair. I have been known to apply this all over my hair come bed time, comb through my hair and wash out the following morning. In my eyes it is an all over hair treatment that is not that far removed from leave in conditioner in terms of hydration. The main difference is the texture, this is not heavy in the slightest and is as close to weightless as you will ever find from a hair hydrating product. It nourishes the hair root to tip all the while soothing and calming an agitated scalp. Forget drying, stripping shampoo's that claim to detox the scalp and pick this spray up. I will freely admit that this was a whim trail product for me, I was so worried that it won't leave me with greasy roots and was fully prepared to have to re-wash my hair. Luckily that was not the case and as a result I have ditched my heavy leave in conditioning sprays in favour of the do it all Palmers Strong Roots Spray. Easily the £3 you will spend on hair care this week. 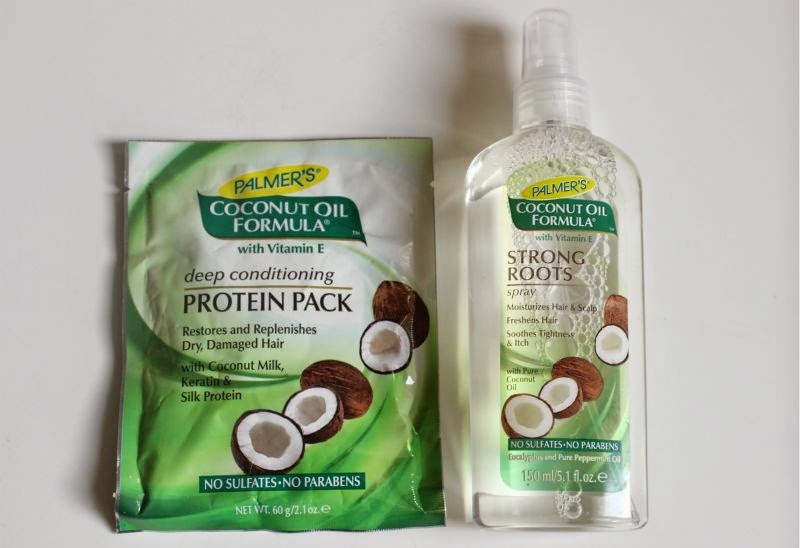 You can find Palmers Coconut Oil Strong Roots Spray via Superdrug for £3.14 - link. I didn't even know that Palmer's have hair range, wow. I haven't seen this here in Malaysia but will keep an eye out for it, I love their body lotions range! I discovered the Protein Pack whilst browsing Sally's Hair and Beauty. Thought I would give it a go and see what happened. I have to say it is amazing, absolutely love it. My hair smells absolutely divine, and I am certain it has significantly helped reduce the shedding I use to suffer with my hair. Definitely going to try this - I love Palmers stuff! I had no idea Palmers did hair products, but these sound amazing really want to give them ago! OMG now this sounds like someting up my alley. Believe it or not your scalp is the most important area to maintain. If your scalp is not healthy, odds are your hair won't be healthy. I'm so excited to find these and try them.